The Federal Clean Air Act establishes two types of national ambient air quality standards for six principal pollutants: ozone, particulates, sulfur dioxide, lead and nitrogen. Primary standards set limits to protect public health, including the health of "sensitive" populations such as asthmatics, children, and the elderly. Secondary standards set limits to protect public welfare, including protection against decreased visibility, damage to animals, crops, vegetation, and buildings. The Bureau of Air Quality Monitoring in the state DEP maintains Ambient Air Monitoring Sites throughout the state to measure pollutant concentrations and assess population exposure. The entire state of New Jersey is currently classified as a non-attainment area for ozone by the EPA, along with much of its surrounding region in eastern Pennsylvania and southern New York State. Ground-level ozone is a pollutant, commonly visible as smog, posing a significant health risk, especially for children with asthma, which also damages crops, trees and other vegetation. It is formed when oxides of nitrogen and volatile organic compounds react in the presence of sunlight. In addition to ozone, urban areas in the state also exceed standards for fine particulate matter, which is produced both by natural causes like volcanos as well as the burning of fossil fuels in vehicles, power plants and various industrial processes. Particulates have been tied to various bronchial and cardiovascular problems, including cancer and heart disease. State officials have attributed much of New Jersey's high level of particulates to out-of-state sources to its west, especially from coal-burning power plants, with significant amounts carried into the state by the prevailing westerly winds. Within the state, the largest source of emissions is from mobile sources, primarily cars, trucks and other motor vehicles. In 2013, the state conducted slightly over 2.1 million initial emissions inspections of motor vehicles, with 10.8% of vehicles failing the initial inspection and 2.7% failing to pass subsequent inspections. Other pollutants are produced from unidentified sources, secondary atmospheric formation or natural emission sources. New Jersey has met the attainment levels for sulfur dioxide (except for a portion of Warren County), lead, and nitrogen dioxide. In addition to pollutants regulated through the National Ambient Air Quality Standard program, federal and state programs limit emissions for designated air toxics known as Hazardous Air Pollutants believed to have adverse health impacts including lung irritation, birth defects and cancer. These emissions are categorized as coming from point sources (e.g. stationary facilities like power plants, refineries, factories, incineration); area or nonpoint sources (small sources of pollution which when added together account for a significant portion of emissions, such as gas stations, auto body shops, pesticide application, dry cleaners, and consumer product use); and mobile sources (on-road cars, trucks, buses and motorcycles and non-road aircraft, trains, lawnmowers, boats, and construction and farm vehicles and equipment). Mobile sources are the state's largest source of emissions. In 2013, the state conducted slightly over 2.1 million initial emissions inspections of motor vehicles, with 10.8% of vehicles failing the initial inspection and 2.7% failing to pass subsequent inspections. Other pollutants are produced from unidentified sources, secondary atmospheric formation or natural emission sources. In 2011, the federal EPA released its National-Scale Air Toxics Assessment for 2005 of 181 air toxics. The state analysis of the average air toxics concentrations indicates that 22 of the pollutants were "of concern" because they were predicted to exceed their health benchmarks in one or more counties. In 2005, all 21 counties were above health benchmarks for the cancer-causing chemicals of Acetaldehyde, Benzene, 1-3 Butadiene, Carbon Tetrachloride, Chloroform, Diesel Particulate Matter, Formaldehyde and Methyl Chloride. In 2011, the Christie Administration withdrew from the Regional Greenhouse Gas Initiative, a consortium to reduce carbon dioxide emissions from power plants across ten Northeast and mid-Atlantic states from Maine to Maryland. The action, which the Governor claimed was due to the RGGI being ineffective and that its implementation would likely lead to increased utility rates, sparked litigation instituted by environmental groups which delayed, but did not halt, the withdrawal. Subsequent bills passed by the legislature to have the state re-join the program were vetoed by the Governor. The national debate over the causes and impact of global warming has particularly focused in New Jersey on potential effects which may result in a rise of sea levels and flooding of inland waterways subject to tidal flows, along with increasing frequency of severe storms. In 2012, the statewide average temperature of 56 degrees was the highest in 118 years of record, and nine of the ten warmest calendar years on record in the state have occurred since 1990. In June 2015, the US Supreme Court found that the EPA's proposed regulations imposing limits on mercury and carbon pollution from existing power plants in an effort to cut emissions linked to global warming failed to assess economic impacts and thus violated the Clean Air Act. Overall, New Jersey emits far less carbon--a total of 27 million metric tons in 2014--from sources monitored by the EPA than other states which remain more dependent on coal-fired power plants. In contrast, Texas led all states with 239 million tons, and to New Jersey's west Pennsylvania emitted 99 million and Ohio 98 million tons. Among New Jersey's sources, the state’s largest carbon polluter is PSEG Power’s Bergen Generation Station in Ridgefield, which burns natural gas and can supply up to 1,200 megawatts of electricity. It alone accounted in 2014 for nearly 10% of the state total, emitting 2.6 million metric tons. Other large carbon polluters in New Jersey included the Phillips 66 Bayway Refinery in Linden, with 2.5 million metric tons, and the Linden Cogeneration and Linden Generating facilities, each with 2.3 million metric tons. The B.L. 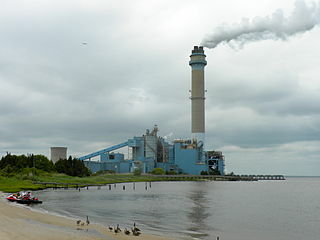 England Generating Station in Cape May is the state's only remaining coal-burning power plant, and is currently seeking approval of construction of a controversial pipeline through the Pinelands that would transmit natural gas to allow it to end the use of coal.